After a very hectic Monday, and really a busy few weeks, I find something incredibly soothing about cool neutral interiors--especially those with rustic charm and the sparkle of a chandelier. Yes, I can already feel my headache subside. Now time to get ready for another social evening celebrating a friends 30th! Hope you had a lovely start to your week. Love these neutrals! And of course, chandeliers are my favorite! Hope you're having a great week Blair! That last room is perfection. I'm loving the black lampshade too. I love the last room! i found myself breathing a deep sigh as i scrolled past each one. 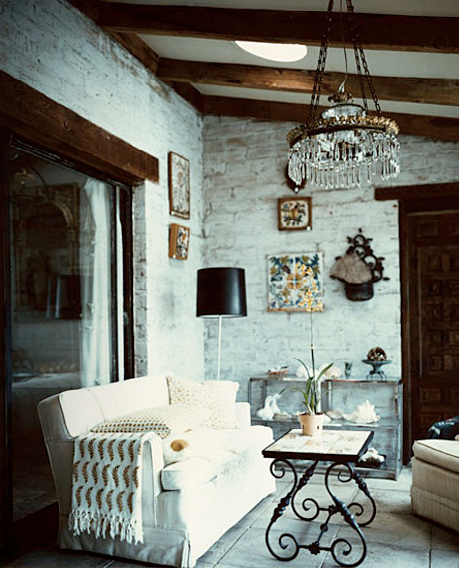 Rustic + chandeliers always does it for me! Hope you are having fun at your friend's 30th! P.S. Love your new profile pic - so PRETTY!! There is just something SO satisfying about the first room...maybe it's the unexpected mix of white, rustic wood, crystal chandelier, & stainless steel. All I know for sure is that it comes together in a way that says pure PERFECTION. Especially loving the third space! And btw your new profile pic is fantastic!! These rooms are beautiful. What great choices you always make! Just the sort of posts I'd think would be perfect for Timeless Tuesday! I'm looking forward to having you and your readers there there! Love these images...so calming! I am doing a little giveaway over on my blog today so please come and check it out! I love the first one...it's gorgeous. I just fell in love with the first chandelier! Oh yes, i am hosting a giveaway together with cookware.com, i thought perhaps you might like to check it out too! i love that last room. so beautiful. 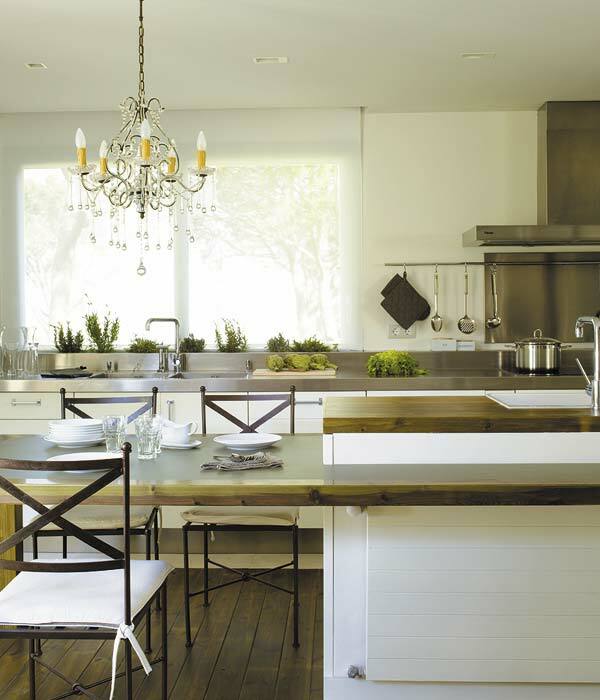 I adore the crystal chandelier in the otherwise modern and clean kitchen. Beautiful! oooh that kitchen is beautiful! just gorgeous -- always a sucker for pretty neutrals and these are perfect. I love all of these images! the floors in that first shot are so pretty. look like reclaimed wood. Love that first image of the kitchen! Hope you have a great night tonight!